I have heard and seen a lot about smart watches so i was lucky enough to purchase one and this is the first Bluetooth watch i own. The 5ive Bluetooth Smart Watch U80 Wrist Watch Sport sits perfectly in the packaging when you take the lid of the white box. Under the watch sits a USB cable and the leaflet that will let you know all the information you will need to know to function this little gadget. The watch didn't arrive charged so i plugged the USB cable into the side of the watch and the other end into a standard USB interface plug. The time it took to fully charge was around two hours so i didn't have to wait too long! Once charged you push the button on the side which is the power button and you are greeted by a welcome screen with a lovely tune. The display on this watch is great and readable even outside and you can adjust the brightness and home screen to a few colours of your choice. Drink, Rest, Sleep monitor, Anti-theft, Power save mode. All work well by pressing gently on the screen and appear quick on the screen with no lagging. 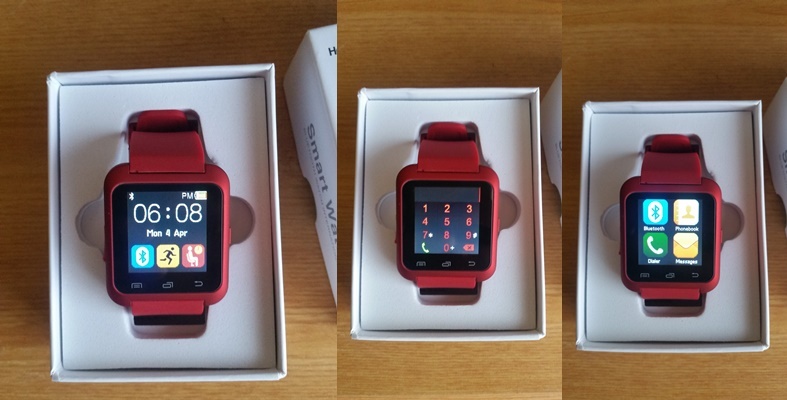 Clock, Tone mode, Volume, Language, Display,Check the battery level, Bluetooth settings and Reset factory settings. All these settings work really well and you can change these to suit your tastes. The watch strap is rubbery but feels smooth and comfortable to wear, the watch doesn't feel heavy around the wrist. 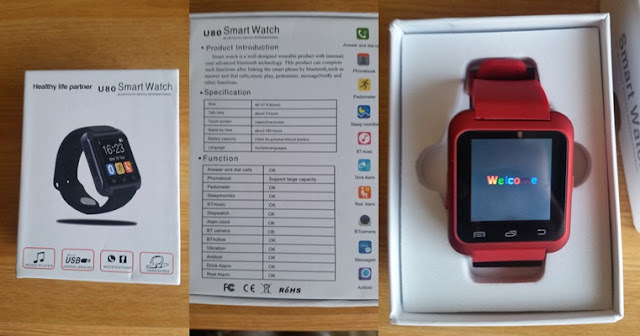 You do need to download "smile notification" onto your phone and "BT notification" from the google play store to use the watch to its full potential. By doing this you will be able to receive messages and access the camera etc and make calls when it is paired to your phone by Bluetooth. ONE TIP i would suggest is when you have downloaded the two apps and the watch is connected by Bluetooth you may get a message still stating to download the BT notification, all you have to do is go to the watch settings and find reset. After it has reset and you turn the watch back on everything will work just fine! The volume on this watch is excellent and produces a loud sound when playing music and even making a call! This being my first Bluetooth watch I'm quite pleased with it, just remember its an extension from your phone when you cant reach it! This work's excellent with my Samsung Galaxy s5 and i found the watch easy to set up and use, when I'm on the go and my phone is in my pocket or bag, this will let me know who has messaged me or calling me. If i want to call someone my phone book appears or i use the easy to use dial screen and the sound is really clear to hear someone or when im talking to that person. Great to stay in contact with people! 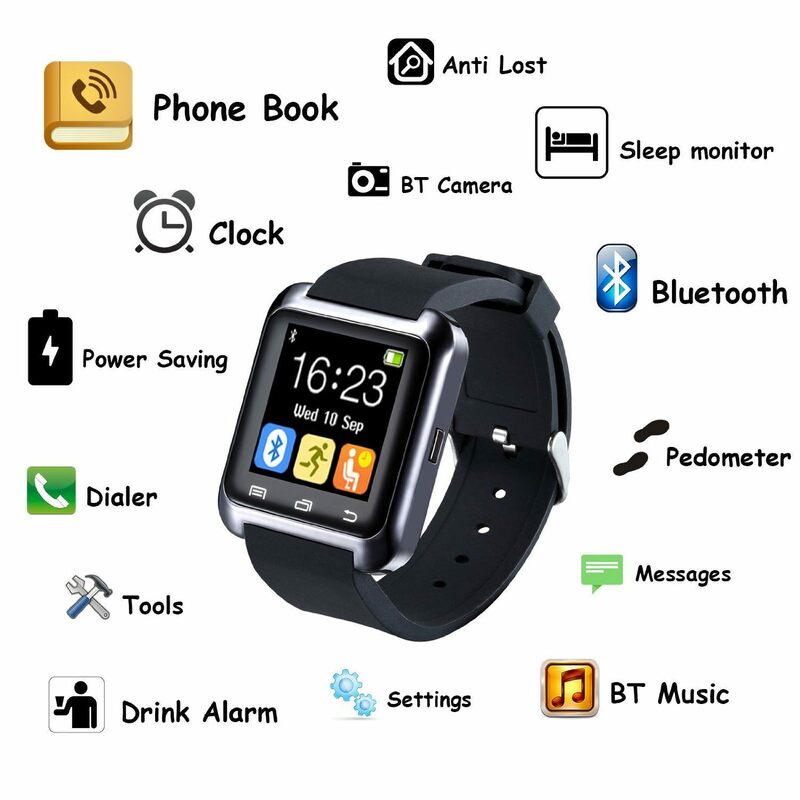 This watch is great for people who want to get into the smart watch technology and at the fraction of the price of other smart watches you cant really complain for what the 5ive Bluetooth Smart Watch U80 has to offer. X Neal.